This story was originally published at HistoryLink.org. Subscribe to their weekly newsletter. This week HistoryLink celebrates Seattle's Pike Place Market, the focus of this year's HistoryLunch fundraiser. More than a century ago, on August 17, 1907, the market opened after local farmers and shoppers rebelled against "commission men" -- distributors who underpaid growers and overcharged consumers. The new public market eliminated the middlemen and gave customers a chance to "meet the producer" and buy their produce straight from the source. Soon after the market opened, entrepreneur Frank Goodwin saw gold in them greens and began building permanent stalls and arcades to house what began as an informal collection of horse carts and street vendors. The market blossomed into an eclectic emporium where local citizens could purchase everything from fresh fruits to flowers to folk crafts to fish from local vendors, many of Japanese and Italian descent, among other backgrounds. By 1941 Joe Desimone, an Italian immigrant, had gone from selling his produce at Pike Place Market to becoming its president and majority stockholder. During its first half-century, the market weathered economic ups and downs, as well as various calamities, but then faced a far more formidable foe -- urban renewal. In 1963, Central Association President Ben Ehrlichman announced plans to tear down the market and replace it with high-rise apartments, offices, garages, and hotels. The city council later gave its blessing, but before the wrecking ball could strike cultural leaders such as Allied Arts, architect Victor Steinbrueck, and painter Mark Tobey rallied to defend "the soul of the city." 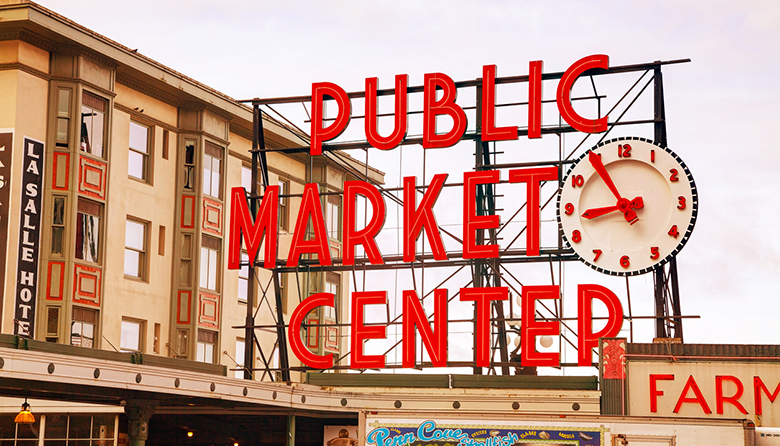 In 1971 voters approved an initiative to preserve Pike Place Market as a historic landmark district, and today the market continues to be one of Seattle's most visited and well-loved destinations. The market is also home to our HistoryLink office, and we are delighted to be one of its proud tenants. A number of cities are celebrating anniversaries this week, beginning with Port Orchard, which was called Sidney when, on September 15, 1890, it became the first town to incorporate in Kitsap County. Its early residents took an active role in bringing the Puget Sound Naval Station (later Puget Sound Naval Shipyard) across Sinclair Inlet to Bremerton. Yakima County has two cities celebrating birthdays this week. Sunnyside incorporated on September 16, 1902, and Wapato did the same exactly six years later. Beginning in World War II, these and other nearby communities benefited from the Bracero program -- which contracted Mexican migrant workers -- and today the vast majority of their residents are of Hispanic or Latino heritage. Over in Snohomish County, Gold Bar incorporated on September 16, 1910, and although its name came from small gold discoveries made in the area, the town's early success from mining would come from copper and arsenic. Back in central Washington, Moses Lake incorporated in Grant County on September 15, 1938, and was named for Chief Moses, leader of the Columbia band of Indians. And finally, on September 18, 1947, Winslow became a city, but later changed its name to Bainbridge Island after annexing the entire land mass. On September 14, 1892, Temple Emanu-El in Spokane became the first Jewish synagogue to open in the state of Washington. Four days later, on September 18, Congregation Ohaveth Sholum opened the first synagogue in Seattle. On September 15, 1915, the citizens of Mabton celebrated their abundant alfalfa crop by opening the Hay Palace -- built almost entirely of hay bales. And on September 13, 1923, Ellensburg held its first rodeo, an event now celebrated each Labor Day weekend. This celebration of Western culture harkens back to the days of the town's origin as a trading post named Robber's Roost. On September 13, 1934, the Los Angeles-based Orville Knapp Orchestra performed a concert in Seattle at the Club Victor that featured what was almost certainly the local public debut of the electric guitar. And on September 16, 1957, Northwest musician Dave Bunker submitted a patent application for his dual-necked Duo-Lectar electric "Touch Guitar." "